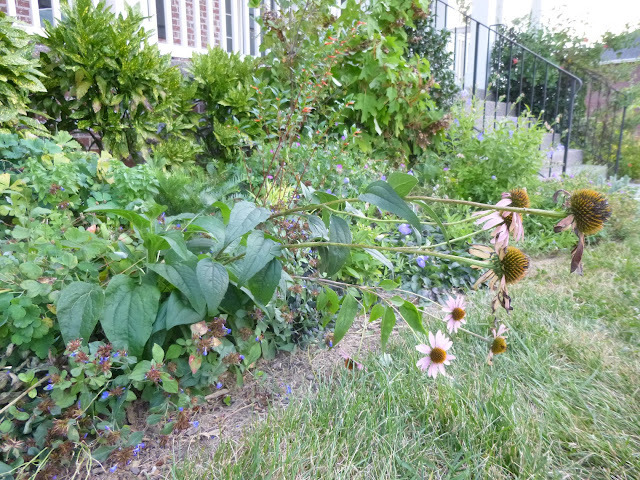 Well, here we are - early August, weeks of temperatures in the 90s (car thermometer registered 97 on the highway today), not much rain recently, brutal humidity and an obstinate gardener who insists on letting plants more or less fend for themselves. Why no sprinkler? No endless hours spent hose in hand? No drip irrigation system feeding precious moisture like an IV to the roots? Because I want to see which plants are tough enough to stand on their own and thrive amid this fiery crucible. Because in a world of 7+ billion people where resource scarcity is real and likely to get worse, I want to garden with minimal inputs yielding maximum beauty and ecosystem benefits. 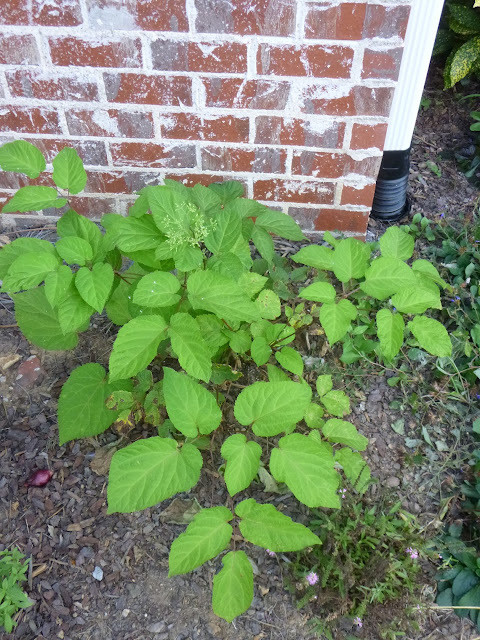 Oakleaf hydrangea (Hydrangea quercifolia) is a native, but it ain't looking too perky these days. 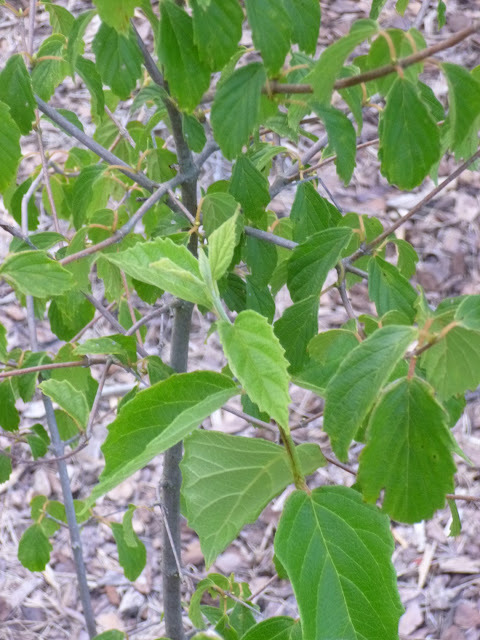 I think it needs more shade (e.g., woodland understory, forest edge) and/or consistent moisture to look its best. 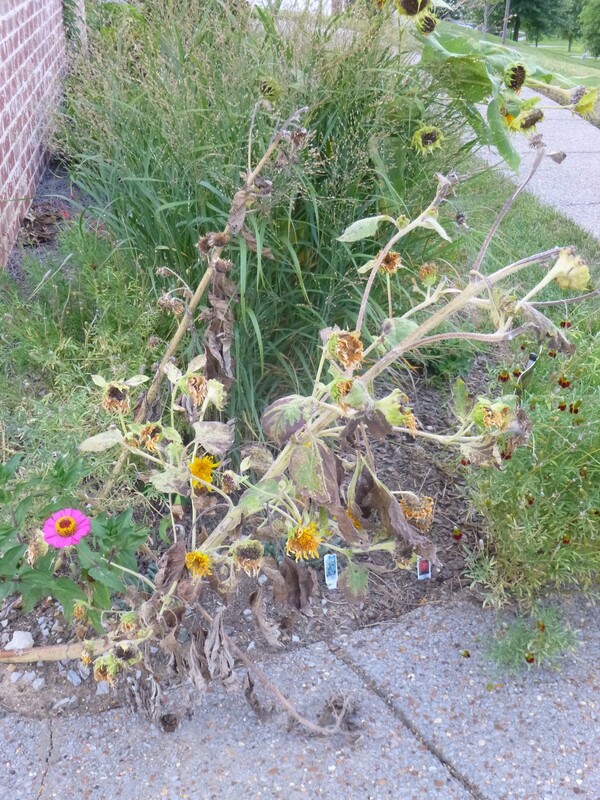 That said, I believe it would survive a drought, it's just not going to win any beauty contests in its current state. 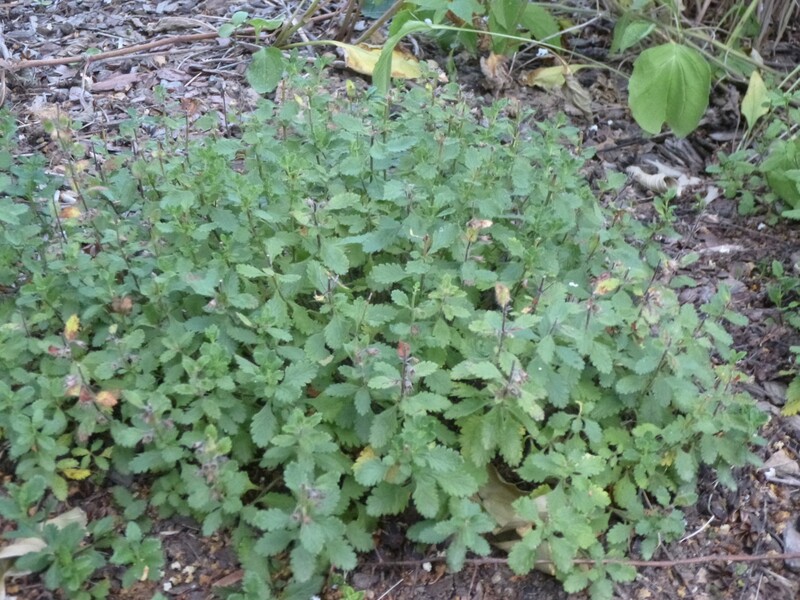 Teucrium chamaedrys, wall germander, native to the Mediterranean and the Middle East, hanging tough as a groundcover. I think this one would actually prefer more sun. 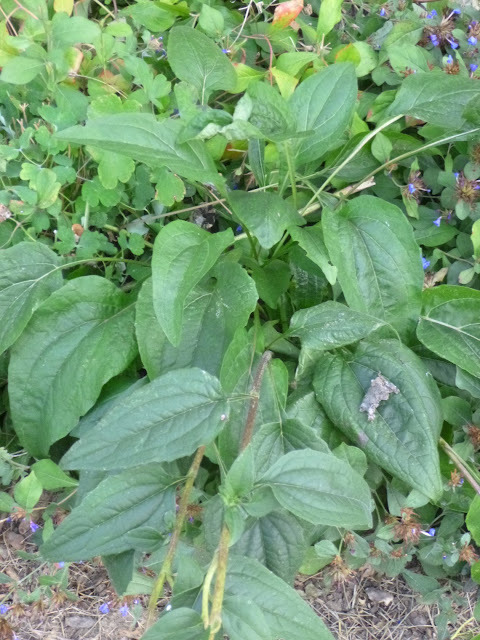 Ajuga genevensis, blue bugle, native to Europe, but acting right at home in Tennessee. This one would probably be happier in a little more shade, but I've got three patches around the garden that are all rocking away in various amounts of sun. 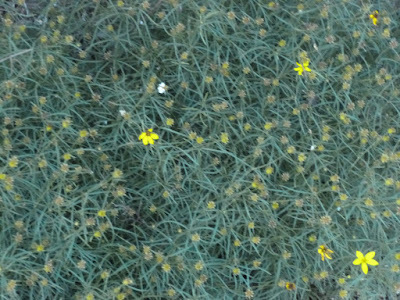 Coreopsis verticillata, threadleaf coreopsis, a regional native (i.e., native to the Southeast, but not really native to Tennessee). Sorry for the blurry photo (it was getting dark), but the multitude of swirling ferny leaves makes a nice piece of abstract art. The bloom has paused, but the foliage and the plant's overall healthy seem robust. 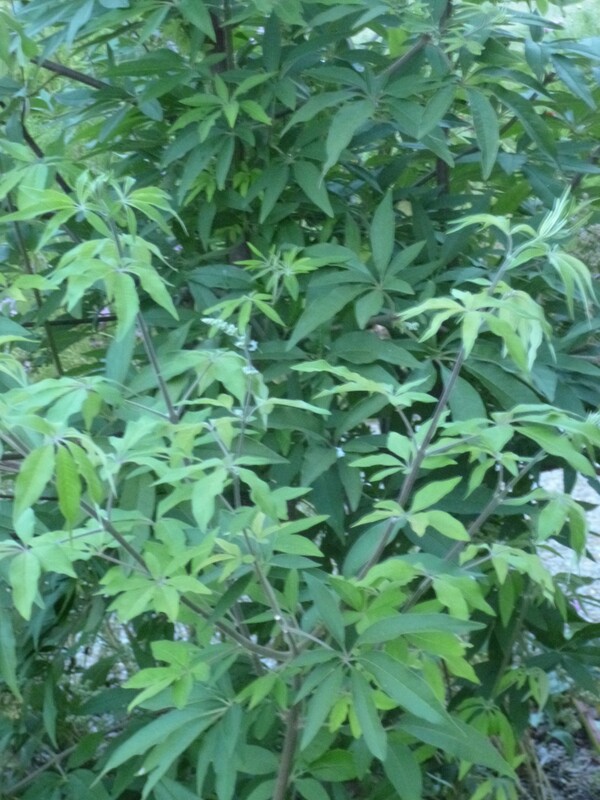 Vitex agnus-castus, chaste tree, another Mediterranean native, not only is hanging tough in the heat and drought, it's actually pushing new foliage! Did I mention this plant lives alongside the driveway, where it tolerates brutal blasts of wind and bakes in the sunshine for most of the day? Juniperus virginiana 'Burkii', eastern redcedar, just beautiful, couldn't care less about the heat and drought. The only thing that bothers it are the dastardly bagworms. Dang bagworms!!@#! Sorry for the flash, but this is one of our native mountain mints, Pycnanthemum tenuifolium. You may not be able to tell from this photo, but the plant seems quite tough and moderately floriferous in its first year in the garden. 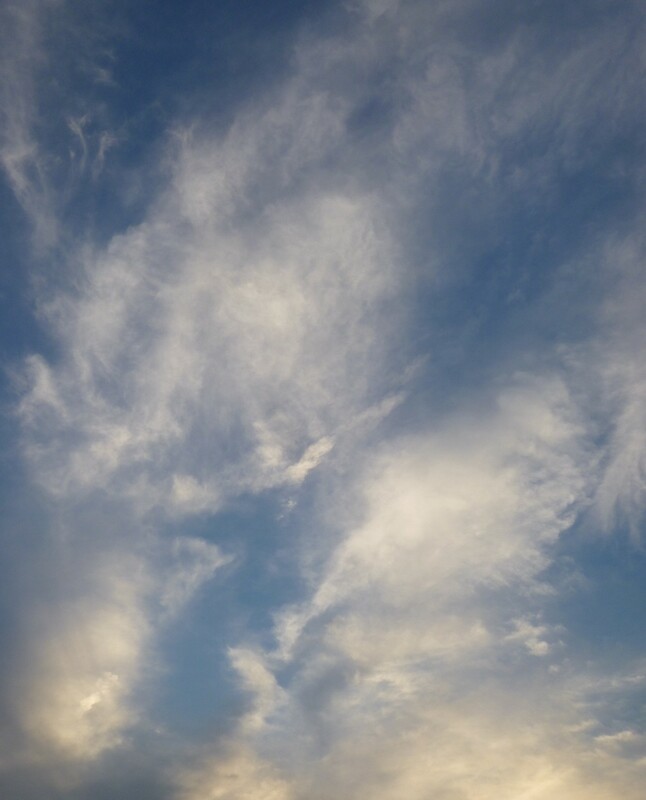 If you look closely in the middle of the photo, you should be able to spot white dots that look like they're hanging by threads. I believe those are green lacewing eggs, which is a good thing, because green lacewing larvae reportedly are voracious predators of aphids. 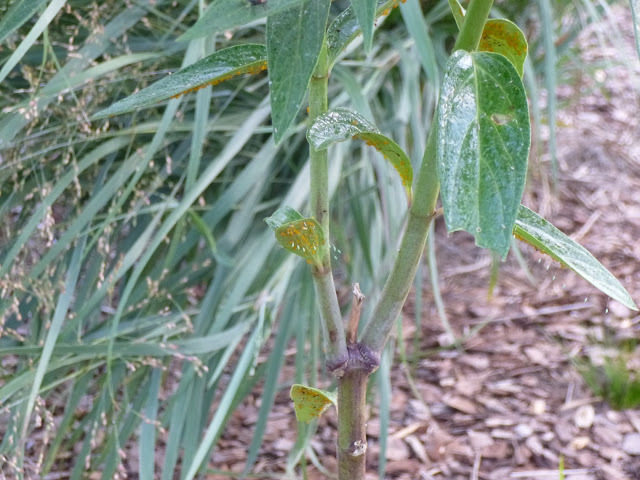 And as you may be able to see, my Asclepias incarnata (swamp milkweed) here is coated with bright yellow aphids, whose sticky, shiny excretions are in turn coating the plant (thus attracting both ants and flies). Hopefully some green lacewings can help bring things a bit closer to balance. And here's an aerial view of the same plant. I originally planted three swamp milkweeds last autumn, but only one managed to grow to maturity this year. 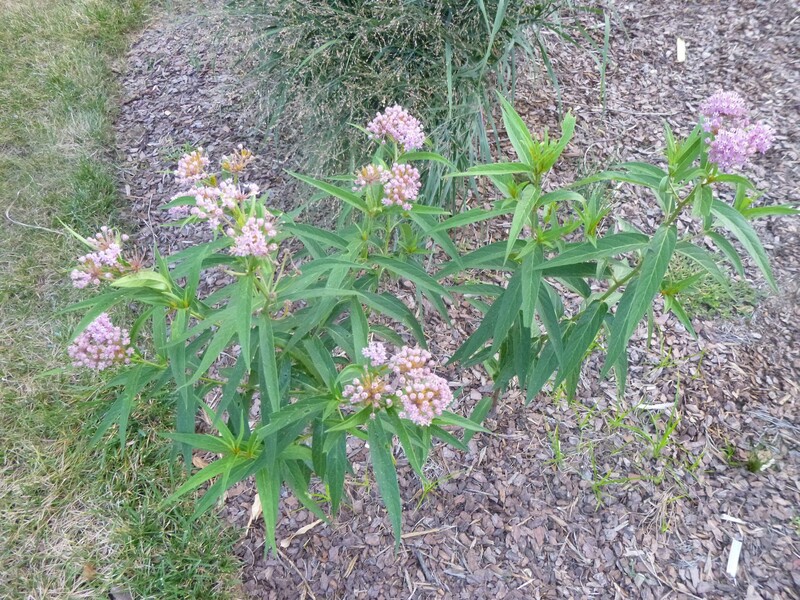 Even though it's a 'swamp' milkweed and would probably love moist or wet soil, as you can see it has good drought tolerance under all-day sun in the far back of my property. 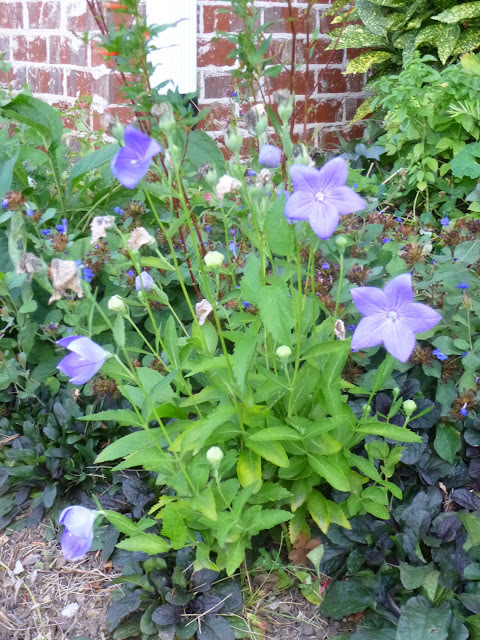 The flowers seem very attractive to bees and butterflies. 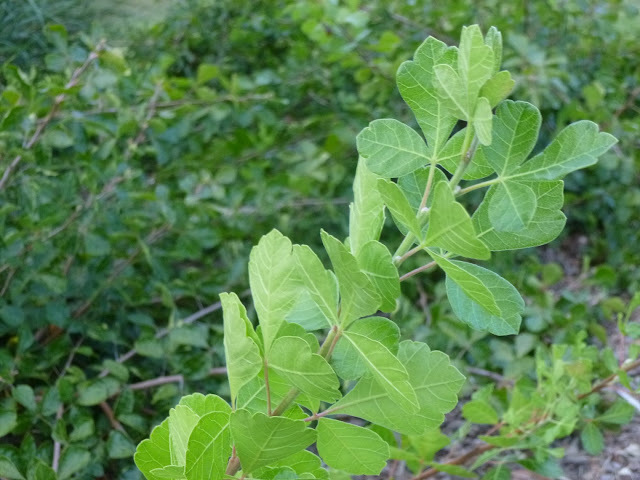 A couple days ago, I saw some caterpillars - perhaps monarch butterfly caterpillars - on the leaves, but when I went to take a photo this evening, I couldn't find any. I guess they were hiding? I'll need to look again in the morning. 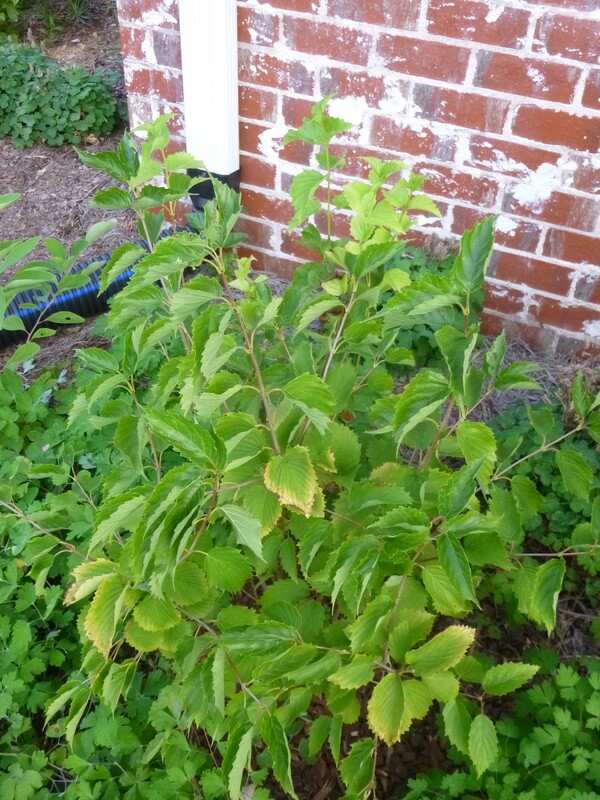 Viburnum dentatum, our native arrowwood viburnum, beautiful foliage and - as you can see - it's pushing new growth despite the heat and drought. 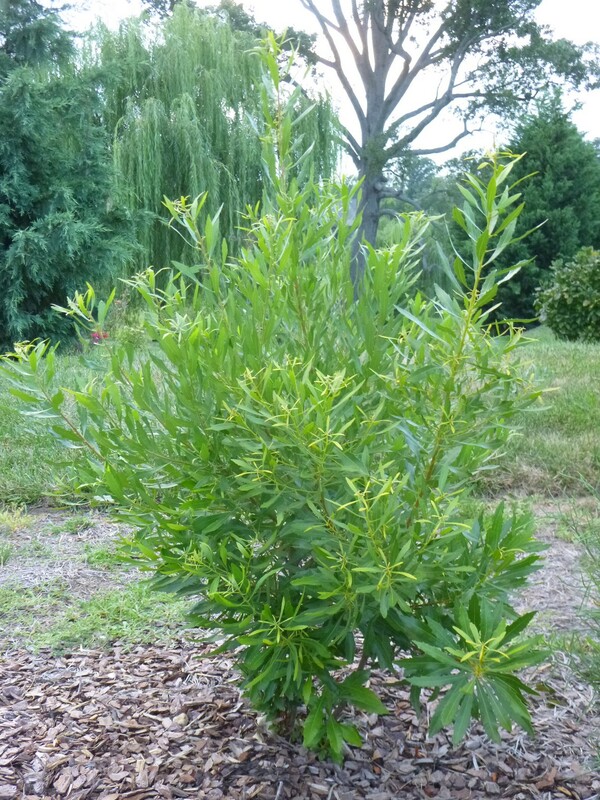 Arrowwood viburnums are usually sold just as cultivars, but this is the straight species and planted in full sun. Morella cerifera, syn. Myrica cerifera, southern wax myrtle, one of my favorite plants so far in 2015, I'd say it has quadrupled or quintupled in size since I planted in last autumn. 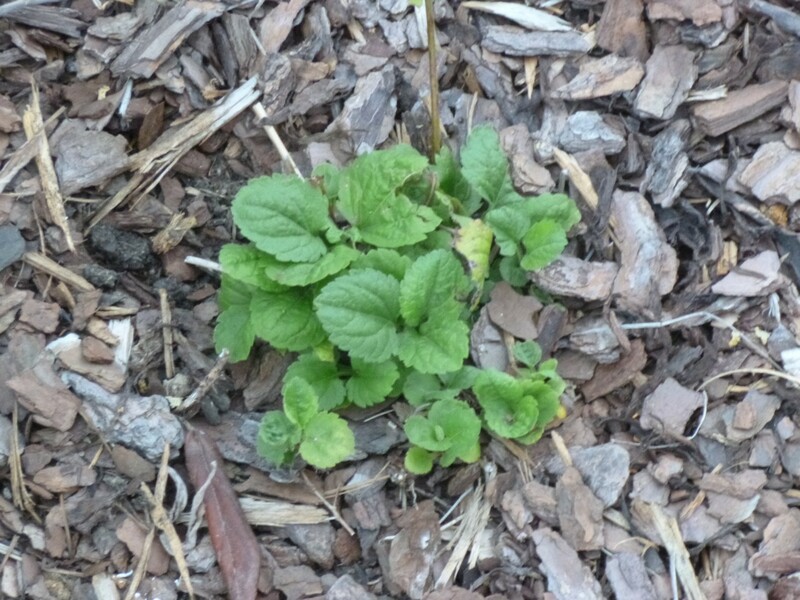 I actually planted two of them, but only this one made it through our unusually harsh winter. 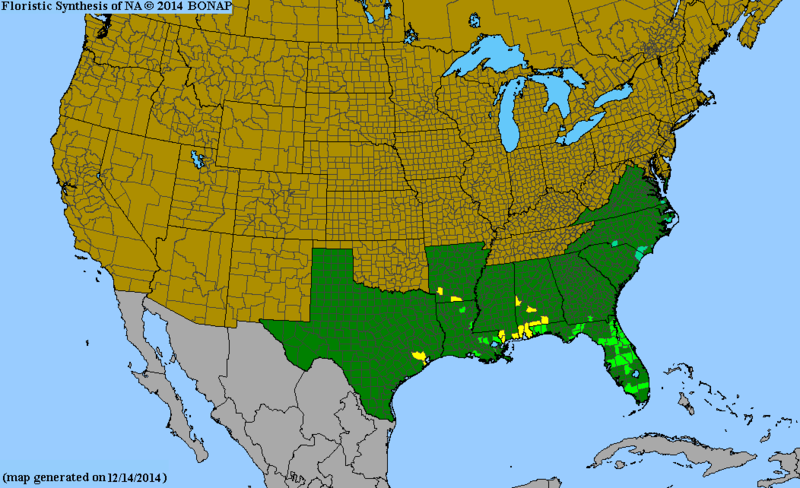 These are widespread throughout the Southeast, but mainly in the Coastal Plain, although there are naturally occurring populations in northern Alabama just a couple hours drive south of where I am in Middle Tennessee. Not a native plant here, but Cosmos bipinnatus is still gorgeous and offers benefits to pollinators -- not to mention rabbits, who gnaw through 6-foot tall stems and then nibble the plant to pieces. Not a native and not always that pretty, but Viburnum 'Pragense' - the Prague viburnum - is slowly winning by respect as a tough survivor. 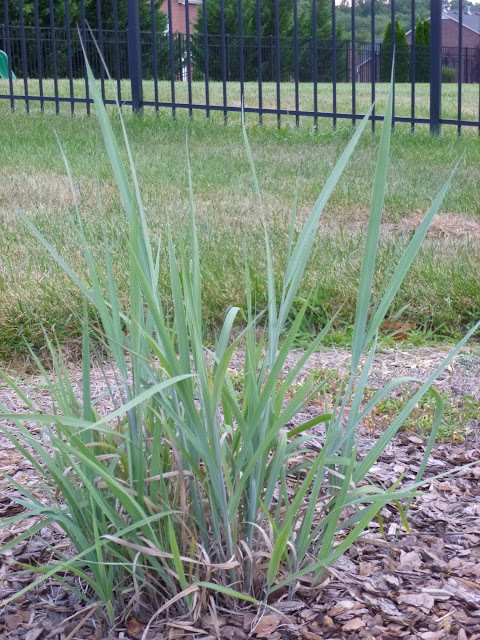 As you can see, this one too is pushing new growth despite the punishing one-two punch of heat and humidity. 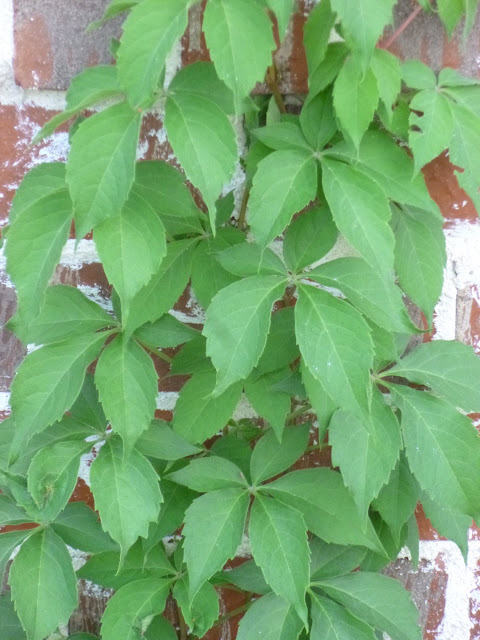 But here's a native vine that is thriving and shining in the heat - Parthenocissus quinquefolia, Virginia creeper - shown here scaling a brick wall along the front of the house. 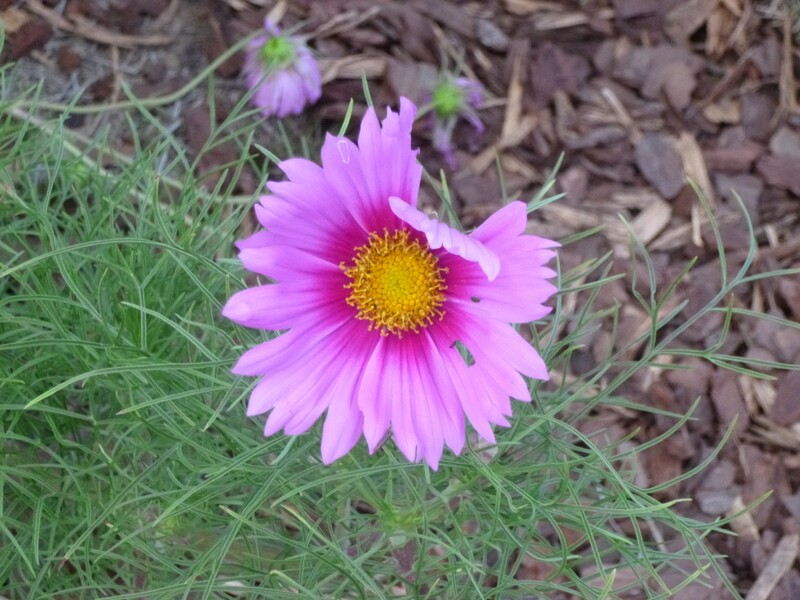 Right nearby you'll find another native - Symphyotrichum laeve 'Bluebird' - the smooth aster. 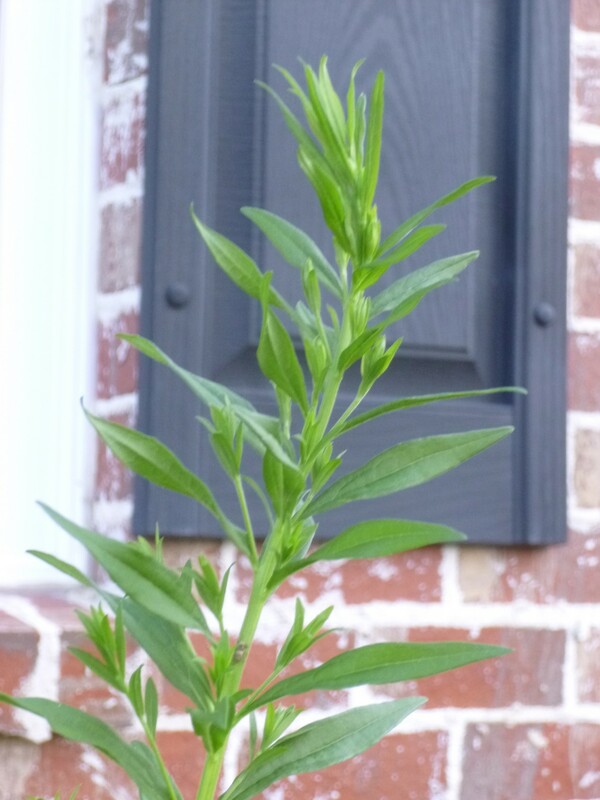 This one is approximately six-feet tall in its first year in the garden and just getting ready to bloom!! 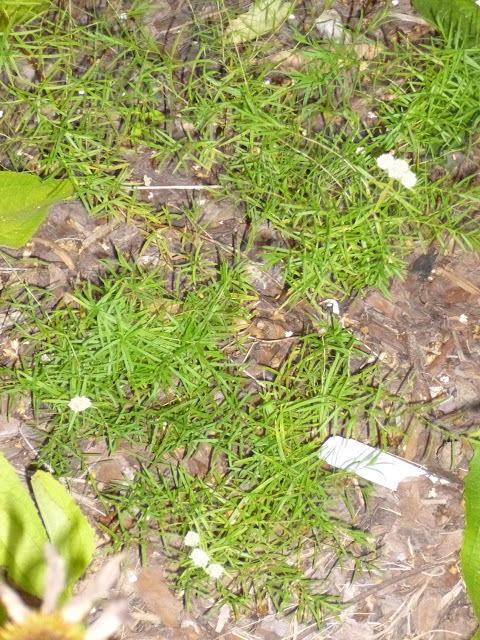 ...the flowers are still hanging on, although the stalks are now parallel to the ground. Not sure how they'll fare next time the lawn mowing and edging crew comes through. It's my first year trying to grow American spikenard (Aralia racemosa). 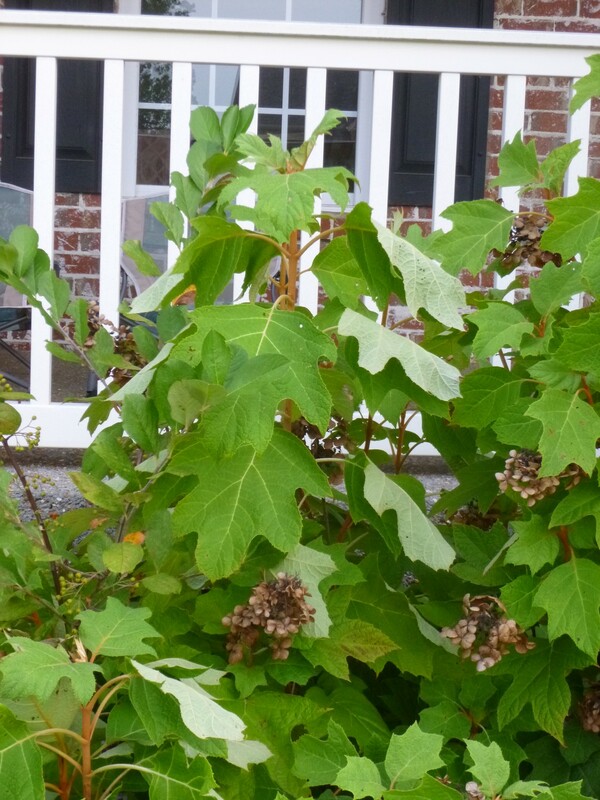 I suspect this plant would like a little more shade, but even in its first year, it seems better able than the oakleaf hydrangea to tolerate sunshine from morning until early afternoon. 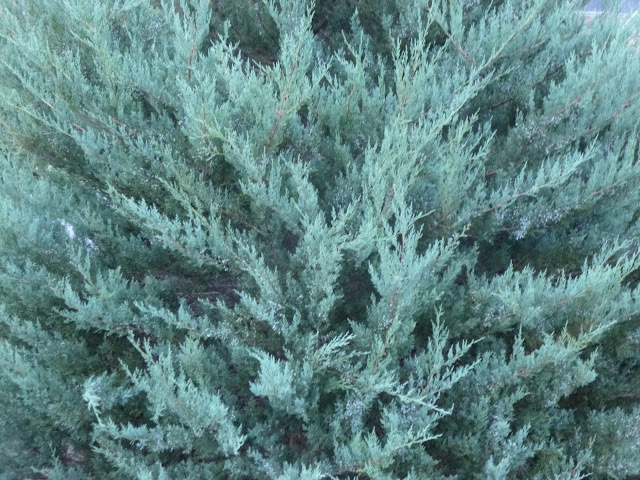 Perhaps my favorite evergreen (evergreen-and-yellow?) 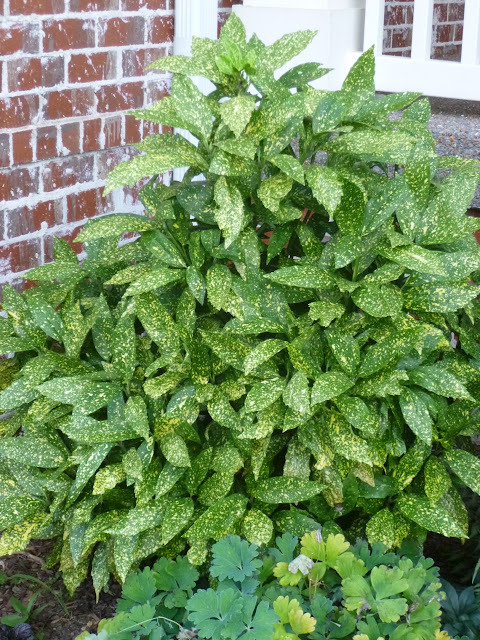 foundation shrub - Japanese aucuba (Aucuba japonica), also know as "gold dust plant". 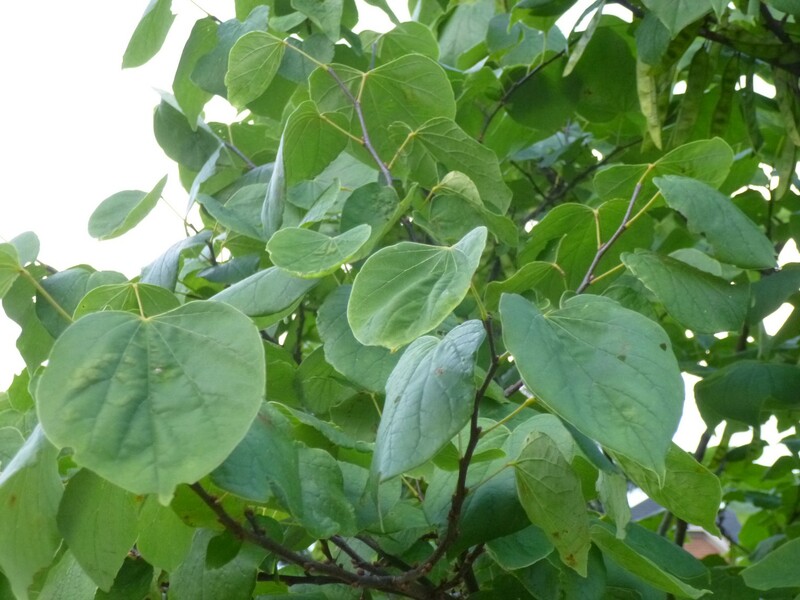 As the common and Latin names suggest, this is native to Japan (plus China and the Himalayas). As long as it has afternoon shade, it seems perfectly happy in hot, humid Tennessee summers. 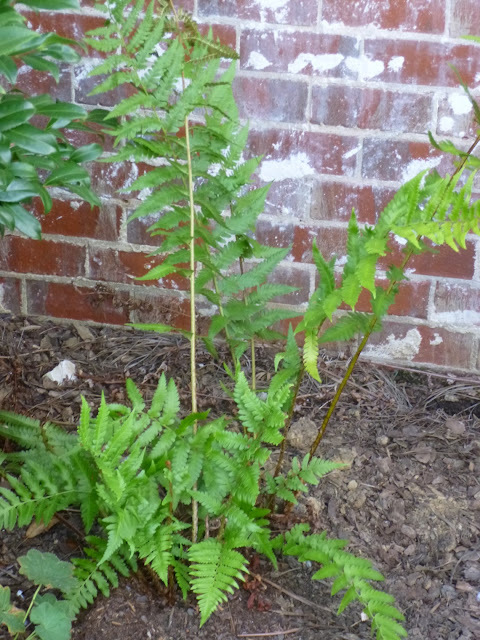 Many ferns have a reputation for wanting/needing consistently moist woodland conditions, but Dryopteris x australis (Dixie wood fern), a naturally occuring hybrid of two other ferns that are native to the Southeast, doesn't mind the heat and seems happy enough in dry soil as long as it gets a good amount of shade. 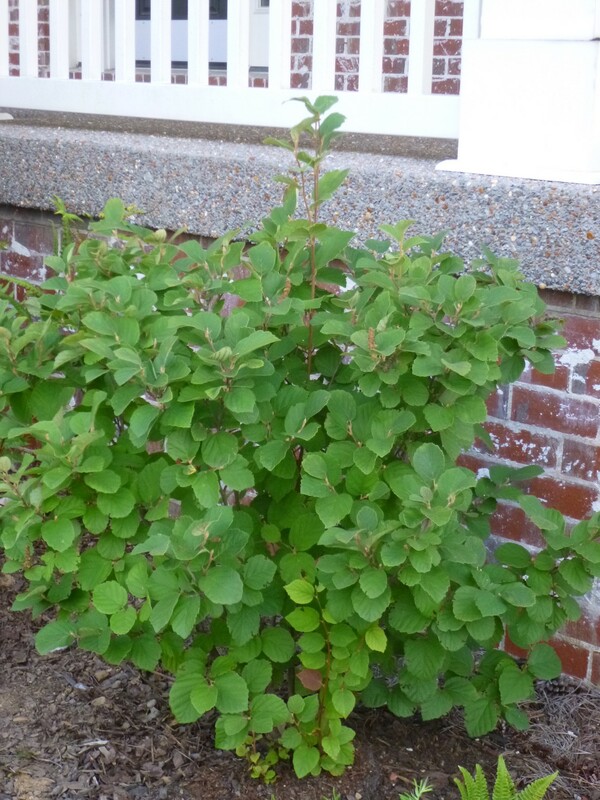 Sources will tell you that dwarf fothergilla (Fothergilla gardenii) prefers acidic soil, but can tolerate neutral or even slightly alkaline conditions. The one time I had my soil tested, it came back as circumneutral and this dwarf fothergilla shrub seems totally at home in the front foundation, where it gets morning sun and afternoon shade. As you can see, it's starting to send up suckers close to the base of the plant, which seems to me a good indication that it would like to naturalize if given the chance. 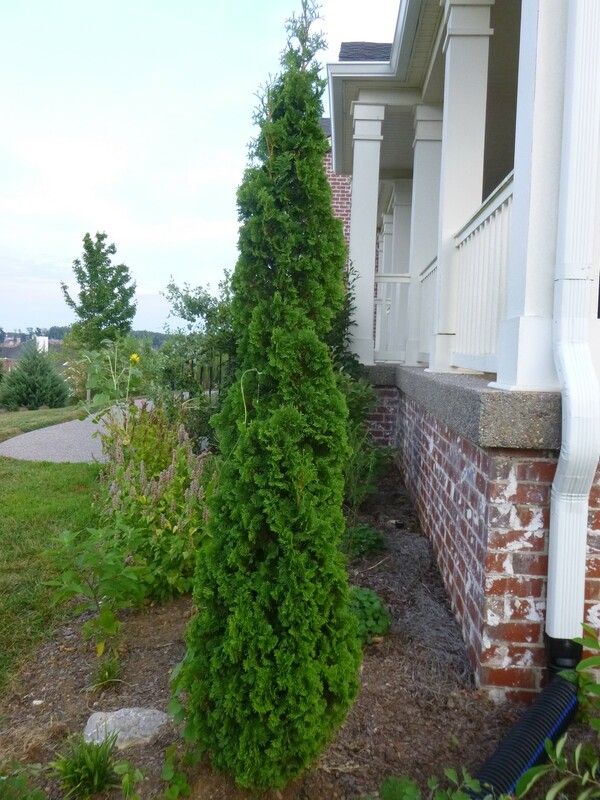 Thuja occidentalis 'DeGroot's Spire' (American arborvitae) is a native evergreen that seems tough enough to sail through the Tennessee summer (in a partial shade setting) with barely any supplemental water. Unlike with the Juniperus virginiana, I have not had any problems with bagworms on the arborvitae (yet). 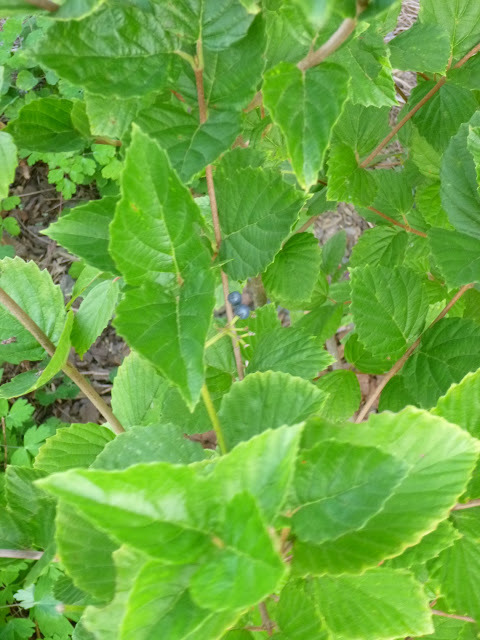 Not all Viburnum dentatum shrubs are created equal. 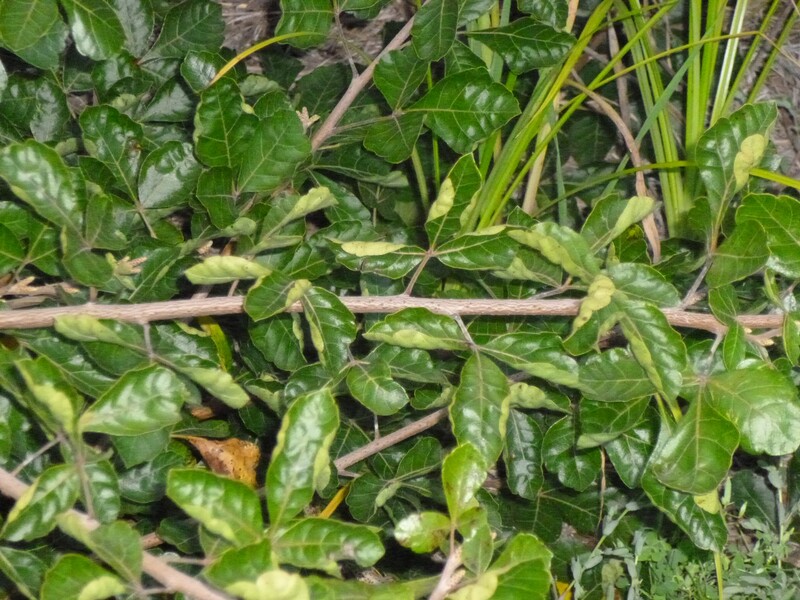 In addition the species highlighted above, I am growing two cultivars. This one ('Pearl Bleu') is in partial shade, and yet it seems more stressed (with some burnt foliage) than the straight species growing in full sun. 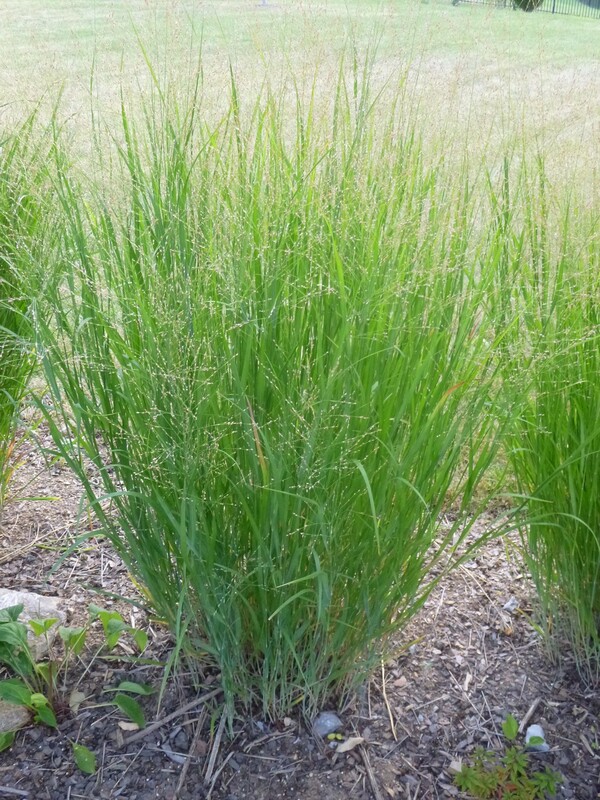 Right next to 'Pearl Bleu' is an arrowwood cultivar called 'Chicago Lustre'. 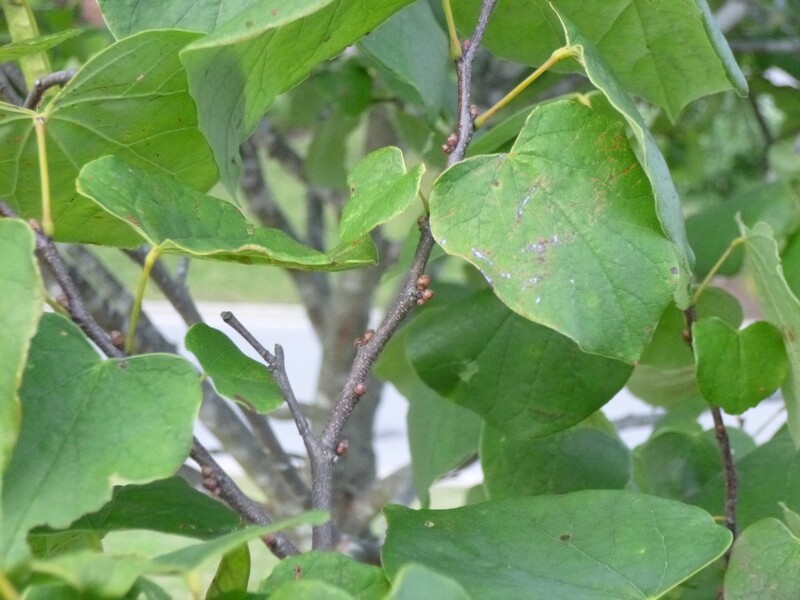 The name is apt, as the foliage truly is lustrous. You can see a few blue berries peaking out from amid the shiny leaves. 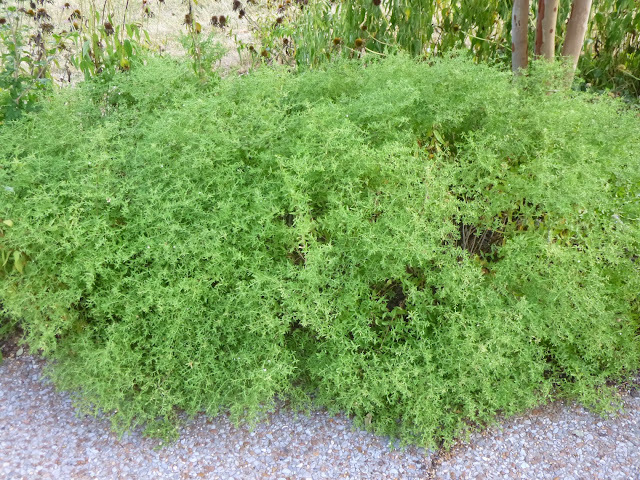 This cultivar so far has lived up to its reputation of being even more heat tolerant and drought tolerant than the species. 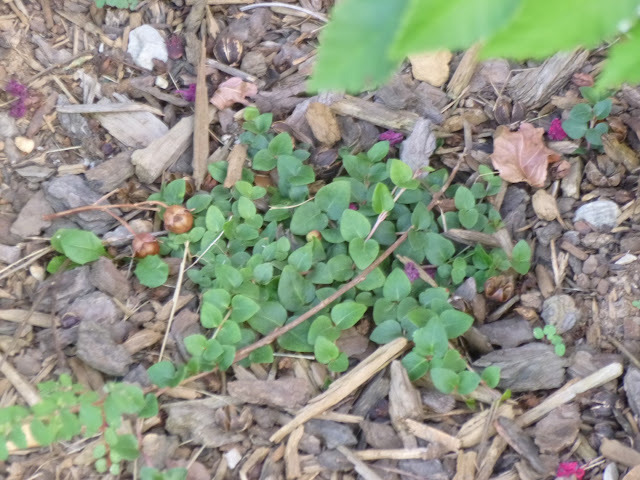 It's easy to overlook this diminutive perennial, but this is Mitchella repens (partridgeberry), a native evergreen groundcover. From what I've read, it has a reputation as being a bit finicky. I tried planting a couple of plugs last autumn and only one seems to have established itself, but it looks like it's growing pretty nicely now and doesn't seem to mind the heat or drought as long as it has a good amount of shade. Apparently, it produces berries that are edible for people (and ruffed grouse), but I haven't seen any yet (either berries or grouse). This is a top-down look at Hibiscus coccineus (swamp hibiscus, Texas star). 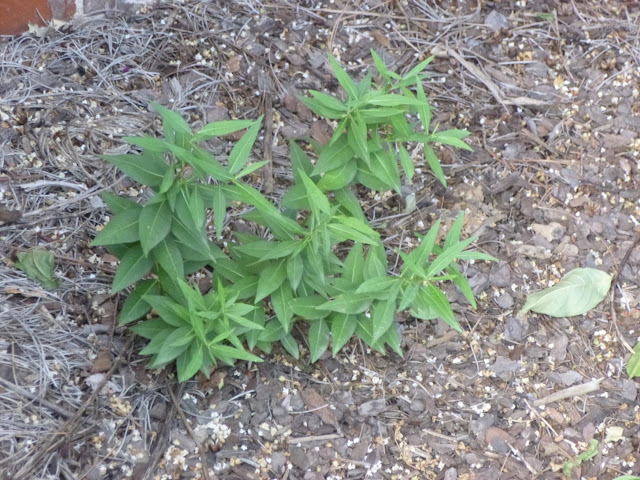 It was nibbled to the nubs by deer or rabbits earlier in the summer when it was planted in the far back of our property, where the deer are more inclined to roam. I transplanted it closer to the house (where it also receives morning shade) and it has responded by leafing out again and forming some buds. Excited to see the flowers soon! 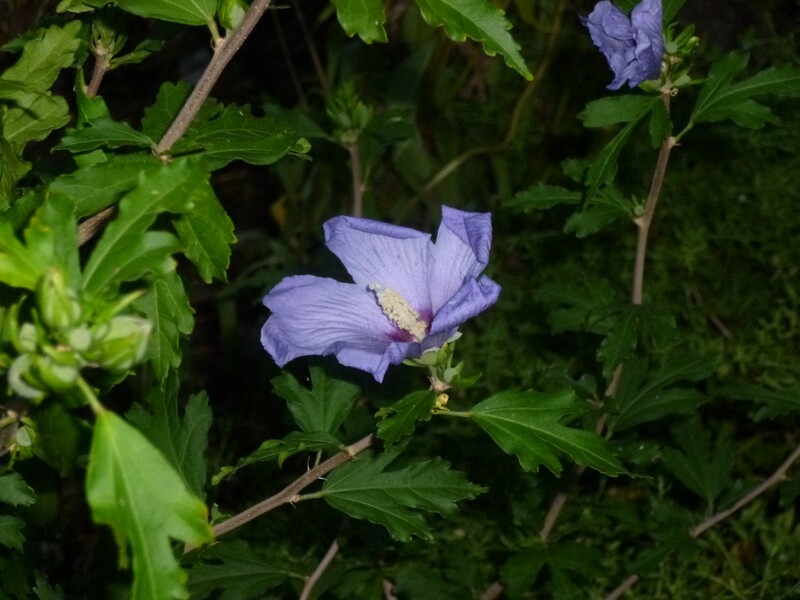 Its other common name is "swamp hibiscus", so I'm sure it would appreciate more water, but it seems perfectly capable of flourishing under drought conditions. I think I've only watered it a few times all summer, and that's just because I'm trying to get it established. 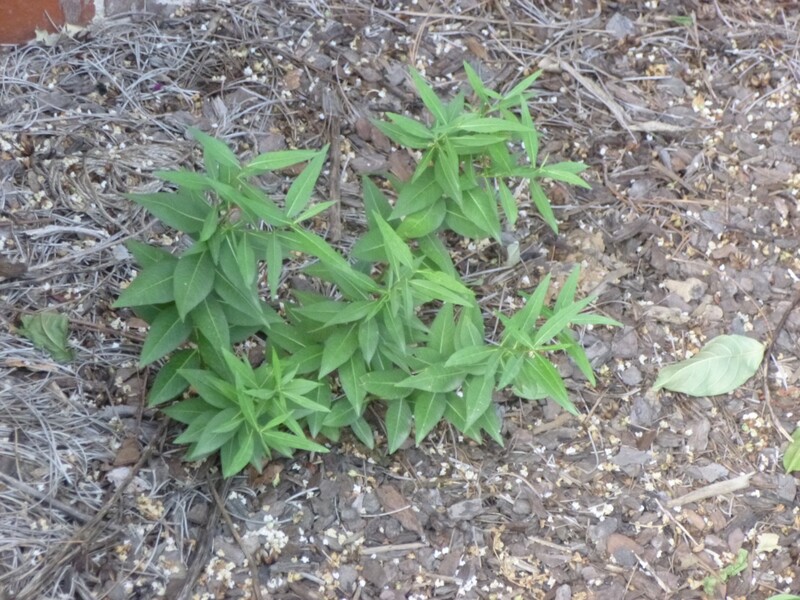 Despite the fact that it's called Texas star, it's actually found more often in the wild growing in Florida and Louisiana. Love our native switchgrass (Panicum virgatum). Some of them have flopped due to heavy rains earlier in the summer, but these tough guys ('Heavy Metal' cultivar) are still standing strong and looking pretty. I can't say as much for Phlox paniculata 'David' (tall garden phlox). I'm torn on these plants. This is the first year that I saw pollinators -- beautiful swallowtail butterflies -- nectaring on the flowers. And yet...well, they're not looking good here in early August. I'm not seven sure if they're dying out or just dying back. Tall garden phlox is native to Tennessee, but we're sort of toward the southern end of its range. It seems more prevalent through the Midwest and Mid-Atlantic. It doesn't look like much right now, but I really like our native blue-eyed grass, which was covered with little pale blue flowers for months earlier in the season. Despite the fact that I've barely given it any supplemental water in its first year in the garden, most of the foliage is still looking fresh and lush in late summer. Why isn't it more popular? 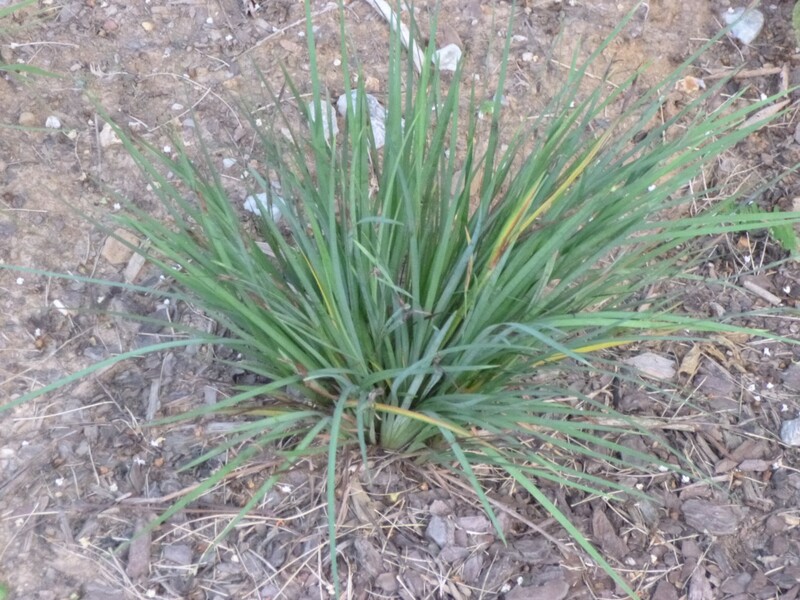 I blame the tongue-twisting Latin name (Sisyrinchium angustifolium). 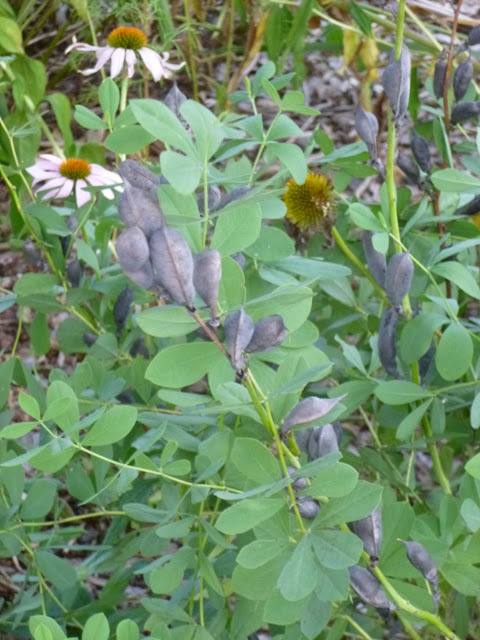 As usual, the foliage on Baptisia australis (blue false indigo) still looks marvelous despite drought and heat. Although B. australis is native to Tennessee, it's much more common further west in Oklahoma, Kansas, Missouri, Nebraska, Arkansas and Texas. This year, for the first time, the plant has the added benefit of large, deep-purple seedpods that rattle when shook. 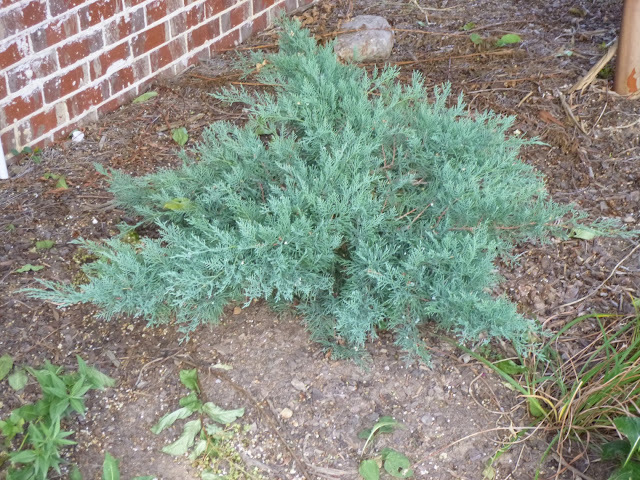 The shrubby 'Grey Owl' cultivar of our native Juniperus virginiana seems unperturbed by the weather. I haven't noticed any bagworms on either of our Grey Owls yet, but I don't think that means they're immune. I assume it means the worms (caterpillars, really) just haven't found them yet. There seems to be some confusion as to whether Amsonia 'Blue Ice' is a hybrid or a cultivar of the Southeast native A. tabernaemontana. Either way, I think it makes a marvelous, tough garden plant. It's supposed to prefer sun, but seems to be flourishing nonetheless in significant shade in my garden. 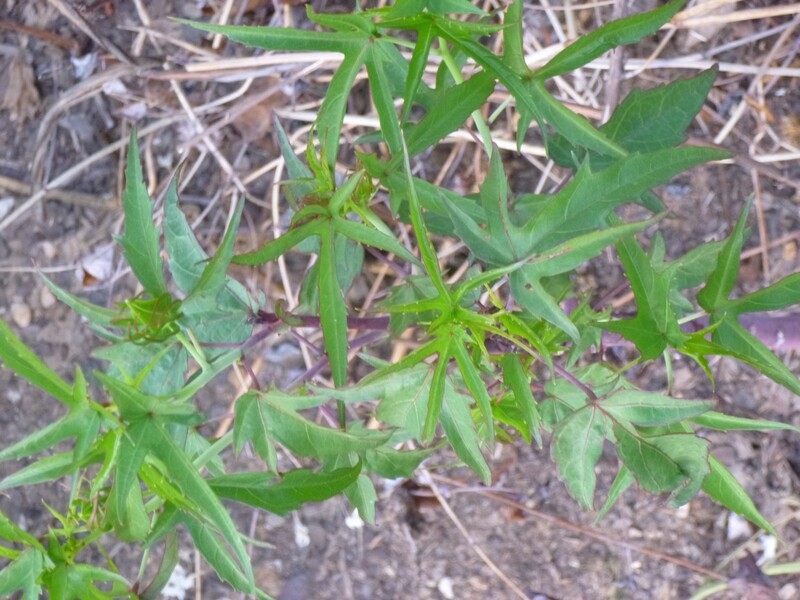 I actually like it much better than A. hubrichtii, which hogs all the attention in the Amsonia genus. It's not all sunshine-and-roses in the Garden of Aaron. 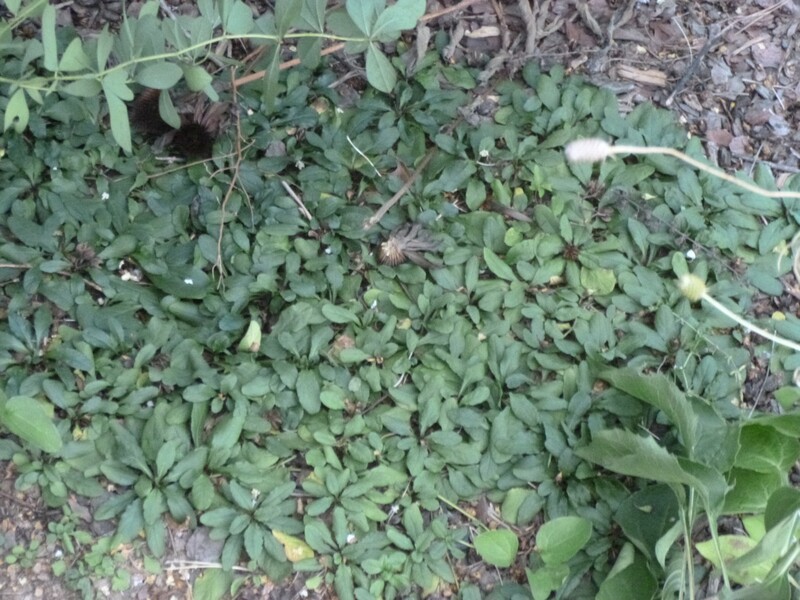 (In fact, it's not roses at all, because I don't have any growing here.) These are stressed out clumps of Agastache rugosa 'Honey Bee Blue'. 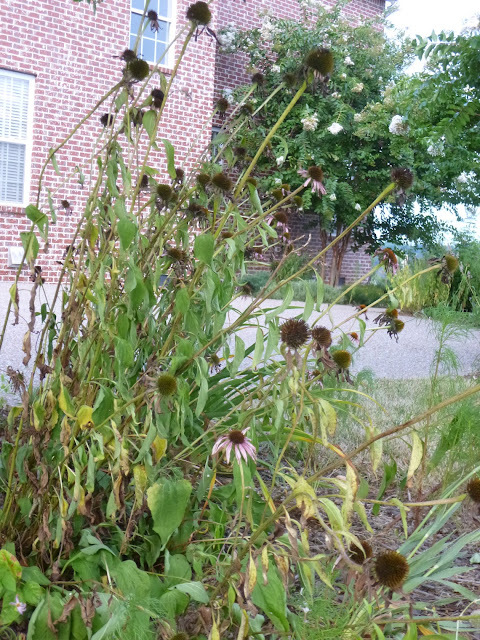 Native to East Asia (China, Japan, Korea and Siberia), these don't seem at all happy at the tail end of a Tennessee summer. It's a pity, because the bees like the long-blooming flowers and the gold finches seem to enjoy the seed. Still, my guess is that they'd prefer a climate with somewhat cooler and/or moister summers. Perhaps my biggest frustration this year has been the poor performance of Echinacea purpurea. It's supposed to be this colossus (Princess Bride reference), but looks dreadful in late summer. 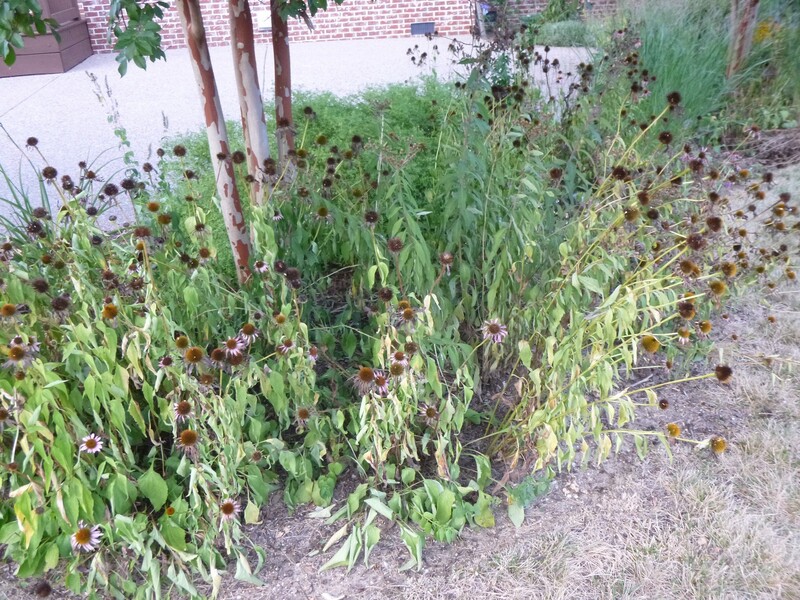 I can't bear to get rid of it completely - it gives too many benefits to bees, butterflies and birds - but I feel like I need to diversify the garden a bit more and pare back on the giant clumps of purple coneflower. Similarly, I'm not too impressed with my trial of our native Eryngium yuccifolium (rattlesnake master). Admittedly, it's supposed to prefer well-drained sandy soil, not heavy clay. 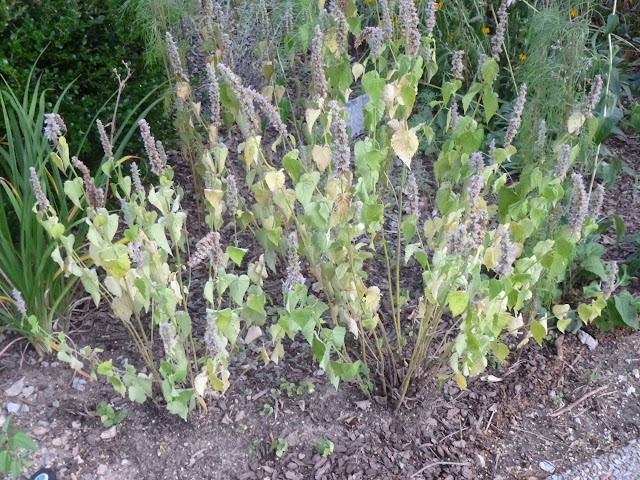 So that could explain the floppiness, but it's supposed to be very drought tolerant, and yet the burnt foliage makes me question that statement. 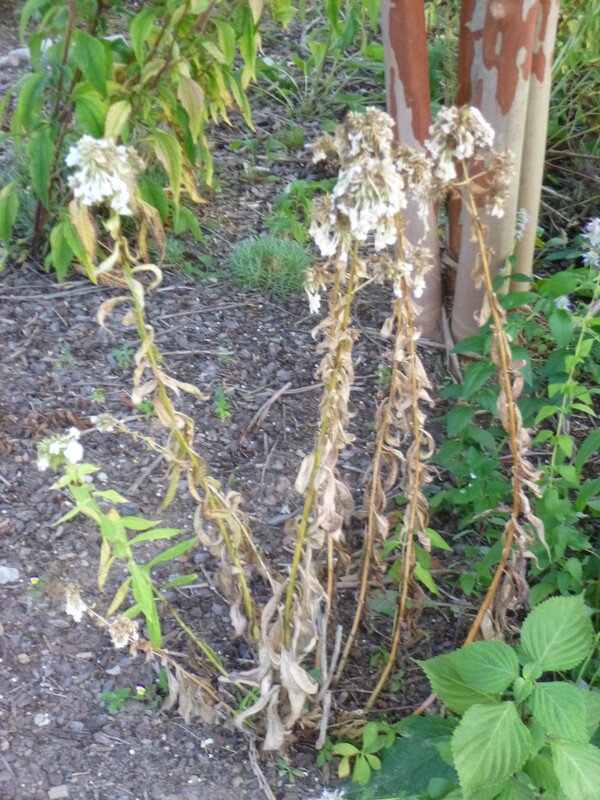 Although, on the other hand, it might have more drought tolerance once it gets better established. 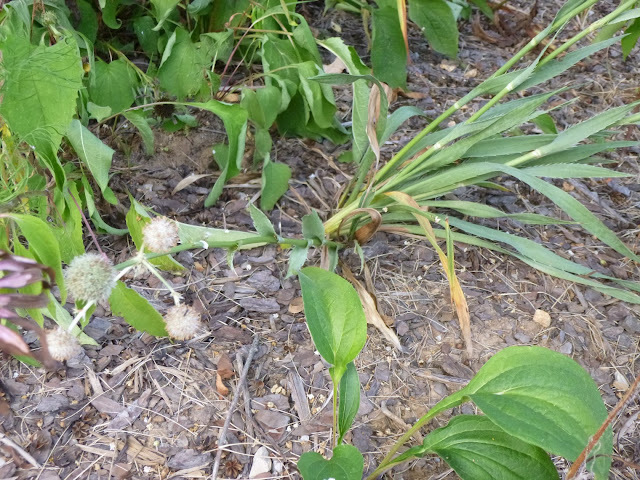 The odd spherical flower balls did attract some tiny pollinators, but not as many as I'd hoped. 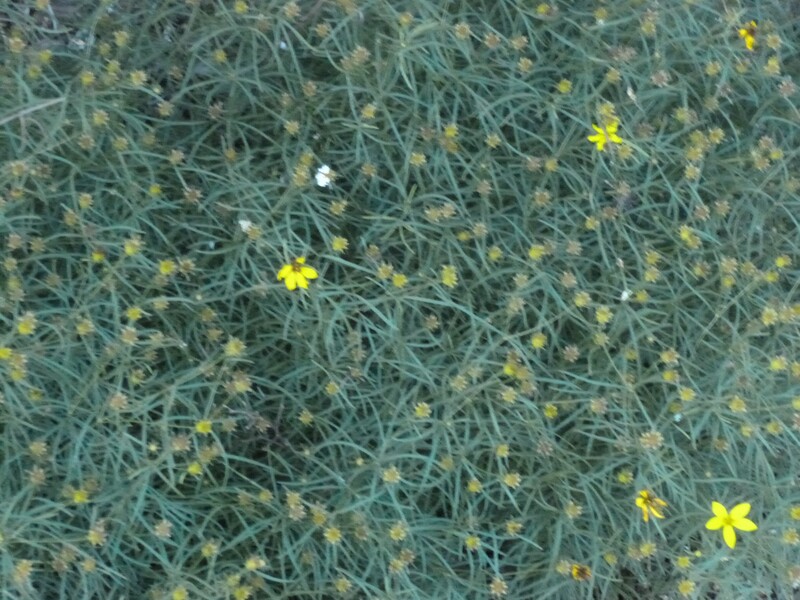 Then again, often pollinators are drawn more to clumps of flowers rather than just a single specimen. A rather pathetic looking clump of Eupatorium dubium 'Baby-Joe' (dwarf Joe-Pye weed). American Beauties claims that this plant will thrive in "dry to damp soils..." Perhaps it can tolerate dry soil conditions in the northern part of its range (it's native along the Atlantic coast all the way from South Carolina up to Maine), but here in Tennessee, I suspect it needs consistently damp/moist soils to be happy. Since I can't offer such conditions, I doubt it has a long, glorious future in my current garden. I'll finish on a high note! Half way through the most I showcased a mangled and dried out clump of sunflowers, but around the side of the house this native annual sunflower (Helianthus annuus) is still cheerfully blooming its head off. 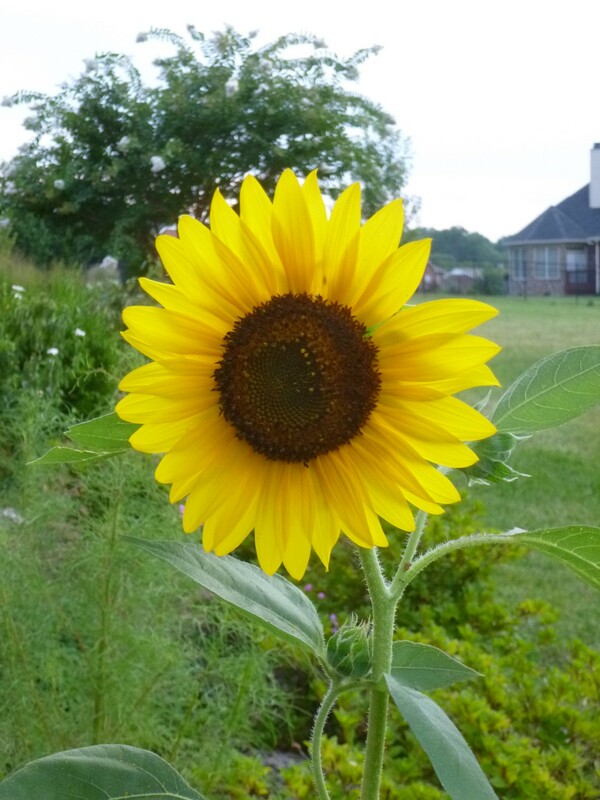 I don't expect sunflowers to look pristine all year. 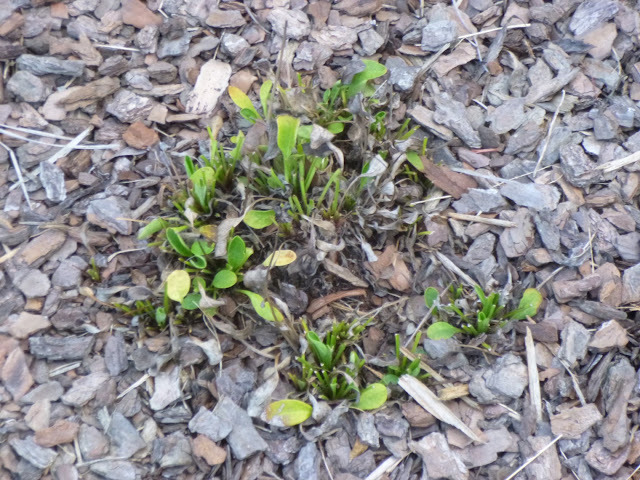 Perhaps because they're annuals, I cut them some slack and I don't mind when they start (literally) going to seed. I know there will be volunteers next year happy to march into the fray and support bees, butterflies, birds, squirrels, chipmunks, rabbits and so forth! I know this has been a marathon post, but I wanted to provide a somewhat exhaustive (exhausting?) 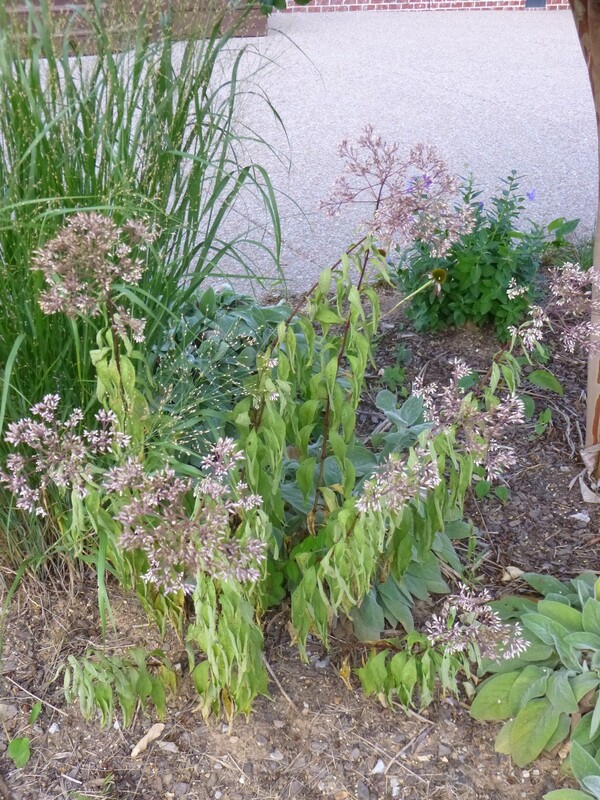 survey to point out that just because a plant is native to a state or region, does not automatically mean that it will thrive in your garden. It may need more sun, more shade, more moisture or better drainage than you can (or want to) provide. 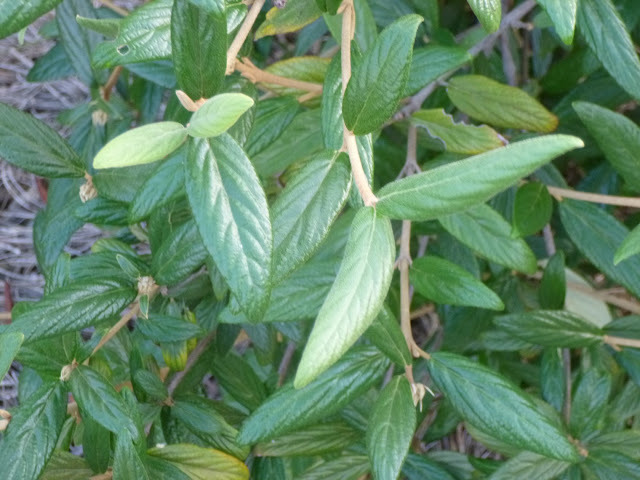 Conversely, it seems to me that many exotic plants are relatively well-behaved (i.e., not invasive or even aggressive) and capable of fending for themselves and adding all sorts of value to the garden - both aesthetic beauty for the gardener and nourishment or shelter for some of the other creatures that share the garden. I greatly appreciate the value of native plants -- especially when it comes to their co-evolved relationships with native fauna such as Lepidoptera -- but I'm happy to welcome many exotics into my garden. PS - Which plants will make it to the cool succor of autumn and which will fall by the wayside at the Garden of Aaron? You'll be "in the know" if you subscribe via email today and get automatic updates straight to your inbox!